King Kahiga Muriuki, popularly known as Mushking in Kenyan entertainment circles is an award winning filmmaker and animator. He produces and directs THE XYZ SHOW for Buni Media, Africa’s first ever puppet sociopolitical satire show. Launched in 2009, this groundbreaking program has now been running for more than 170 episodes and is followed by 10 million viewers on television in Kenya and throughout the continent (on DSTV), on 12 radio stations across Kenya, and online on various distribution platforms, on Facebook, Twitter and YouTube. Every production week King leads Buni’s crew of 60 and XYZ’s cast of latex characters to challenge the local and international politico-social elite with wit and gusto, and nothing is off-limits. Inspired by the French “Guignols de l’Info” and the British “Spitting Image”, THE XYZ SHOW can also be described as “The Daily Show” with latex puppets (and without John Stewart). Winner of the 2013 Africa Magic Viewer’s Choice Awards for Best TV Series and most recently the 2017 Kalasha International Award for Best Animation Production, THE XYZ SHOW has been featured on CNN, the BBC, Variety Magazine, Reuters, AP, AFP, VOA, RFI, The Guardian, The Observer, MNET, and many other news outlets worldwide. King also develops content for NGO’s and corporates such as AMREF Health, Safaricom, Google and Coca Cola just to name a few – he is also an acclaimed music video director, his videos for East Africa’s biggest artists being on rotation on regional and international entertainment channels such as MTV, Channel O and Trace TV. His photography and artwork have been featured in local dailies such as The Daily Nation and international outfits such as The Huffington Post. 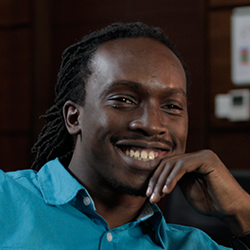 Muriuki was a presenter on the panel GLOBAL ROUNDUP: How news organizations are using satire online around the world at ISOJ 2018 on Saturday, April 14 @ 11:15 a.m.